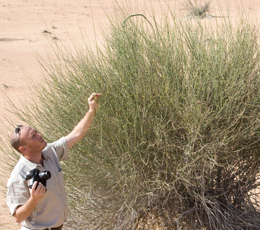 During the period of Jun 2004 until Feb 2005 a study was carried out to assess and quantify the vegetation cover and plant community in the Dubai Desert Conservation Reserve (DDCR). This was done to provide baseline data that will serve as the preliminary basis for temporal comparison, provided that monitoring is a continuously ongoing activity in DDCR. An emphasis was placed on assessing the density, cover and diversity of the flora of DDCR and in addition an attempt is made to map the vegetation of DDCR. A total of 269 plots covering 1883000 m² were sampled over the DDCR and Al Maha Reserve (AMR). The sampling was done using plot sampling approach over the 2 main habitats; Gravel plains and Sand dunes. A standard of 10% coverage was maintained. In each plot several parameters were measured for each species; density, relative density, frequency, relative frequency, abundance, relative abundance and importance value. Diversity indices were used to quantitatively assess the diversity of plant communities in DDCR and to compare different habitats. The floral diversity of DDCR includes approximately 37 species, 6 of which are trees, 26 are shrubs and dwarf shrubs while the remaining 5 are grasses. Two major habitat types were identified, the Sand dunes and Gravel plains. Each is recognized for its unique terrain characteristics and floral community. The area is a good representation of the habitat of its surrounding ecosystem. Only 28 naturally occurring species were recorded throughout the study. Floral diversity is considered low to medium in DDCR. DDCR and the AMR comprise one ecological unit as they are supposed to share the same physical and biological factors with the same processes occurring. However, land use and management regimes are drastically different in various parts of the region. In some areas severe overgrazing has been taking place over a long period and still occurs with increasing stocking rates, while in other areas strict conservation measures are in place for sustainable use of the resources. In conservation areas, grazing is replaced by wildlife herbivory thus representing a more practical image of a natural, dynamic desert ecosystem rather than excluding grazing completely. Thus the differences observed between the habitat structures in both areas are attributed to man-made impacts rather than natural processes. The AMR showed better habitat quality compared to the DDCR and signs of habitat regeneration were evident, especially over the gravel plains habitat. This regeneration is not very drastic but this could be attributed to the relatively short period of conservation and the scarcity of rainfall. Biodiversity was increased in the Al Maha Reserve and diversity indices showed higher values and a tighter range of variation in Al Maha compared to those in DDCR. Densities of species that are still occurring on both areas showed the same drastic difference between the two areas emphasizing the impact of the livestock over grazing. This investigation showed that the DDCR region is severely degraded and is exhibiting a high degree of habitat fragmentation. Analysis results showed that DDCR is composed of a very fragmented landscape that do not share the soil-type and flora communities over large continuums, rather it comprises a group of isolated islands with different properties. The scale of fragmentation is higher in the northern parts of the DDCR while in the southern part a large area was recorded as totally void of vegetation. These vegetation-void areas are occurring in the immediate vicinity of the two largest camel farms in the southern range of DDCR. Al Maha Reserve showed a more discrete pattern of habitat distribution. The landscape was observed to be more organized and continuums of homogenous habitats where more readily detectable and larger in spread over the study region. The landscape detected in Al Maha could be considered as the standard for Dubai Inland Desert except for the lack of tree species. Gravel plains are only comprising small fraction of the total DDCR surface area (>10%). Nevertheless, unique floral species are recorded as only found on gravel plain and not on the dunes. These two facts makes it a higher priority to device special conservation measures and rules concerning gravel plains and all activities (off-road driving, grazing, tourism) involving them. Gravel plains must be assigned as very sensitive type of habitat in DDCR.